As we enter the late summer season, more and more hail can be expected to fall across the Front Range. Colorado’s changing weather can result in intense storms that pass as quickly as they form. 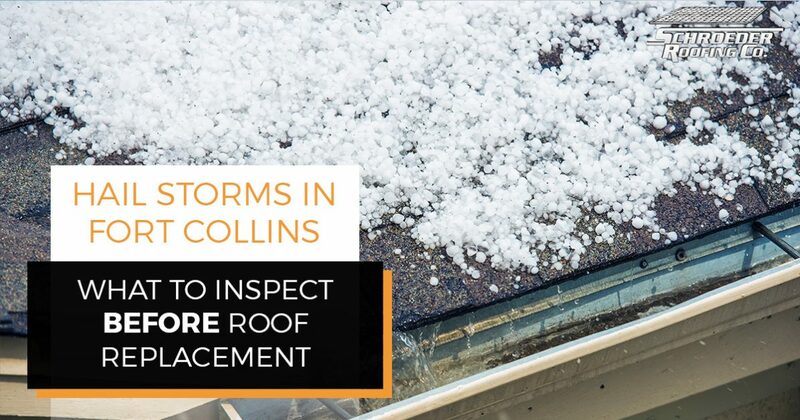 If you’ve experienced the results of some of the recent hail damage in Northern Colorado, it may prove useful to do a roof inspection. Homeowners in need of roof replacements in Fort Collins, Loveland, and beyond have relied on the quality and reliability of Schroeder Roofing since 1977. Our commercial and residential roofing contractors have worked hard over the decades to develop amazing results at affordable prices. 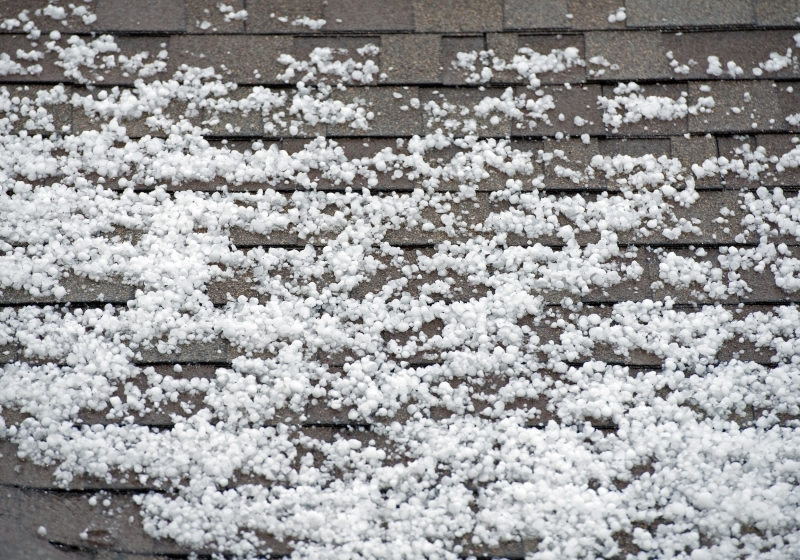 As your trusted Northern Colorado roofers, the Schroeder team is often inundated with calls after heavy hail storms. Today, we’ll cover a few signs of hail damage, and whether or not your home’s condition requires professional roof repairs or replacement. If you suspect your shingles are compromised by years of hail damage, be sure to call us for an inspection! Your gutters are made to be rigid enough to support heavy loads of stormwater. If you notice dents on your gutters or downspouts, it’s likely that your asphalt shingles have taken a similar amount of damage. Your deck or patio is typically sealed to protect against the elements, including hail to a certain degree. Be sure to inspect your exterior surfaces after a hail storm for signs of damage. While concrete and asphalt surfaces will likely not yield helpful results, your painted deck and fence may show signs of chipping. The water cooler on your home or the air conditioner beside it are comprised of metal components, making it easy to inspect for the impact of hail damage relative to the rest of your home. Skylights, vents, and other elements can also be quickly checked for damage. No matter what your inspections have revealed up until this point, the decision to call a roof replacement company (and contact your insurance!) will rely almost entirely on the state of your asphalt shingles. Keep in mind that damages can range in size, from easily spotted craters to smaller voids. Even minor disruptions to the granules on your tiles can result in big consequences! The texture on your roof is here to help maintain the integrity of the asphalt material beneath it. When an impact from hailstone occurs, these granules can lift off, leaving your shingles exposed to future problems. Unless proactively repaired, impacts can begin to leak and necessitate full roof replacement services. The number of hits. The number of impacts on your roof will hold a heavy weight in considerations for a full replacement. Homes with minor damage may benefit more from cost-effective roof repairs. Area size. In many cases, your insurance company will ask how many hits your roof has taken in a select space, such as 10 feet by 10 feet. If you surpass a certain number of hits, the insurance company will find more success in validating your claim. The scope of damage. Insurance companies will also seek out how much of your roof sustained damage. Hail spots on only one side, for example, may be insufficient to satisfy a claim. If three sides of your roof are compromised, the outcome is much different. Slate and clay roofs will often produce noticeable cracks or gouges along the surface. Run your hand over the surface to see if you can feel these texture changes. Wood shingles do not hold up as well to impacts, and their failure will be more obvious. In most cases, wood will split down the middle upon impact. Metal roofing is often the most durable chose, and those inspecting for hail damage will often have the easiest process. Damages to metal will be very obvious compared shingles. As you can see, several factors play into how you should proceed with your Colorado home’s roof. If you’re on this post seeking out the best roof replacement in Fort Collins, Schroeder Roofing is here and ready to prove our value. We approach jobs of all scopes and sizes with honesty and consistency to ensure you are left with long-lasting and cost-effective results. Contact us today to learn more about our residential roofing services or to schedule your inspection!